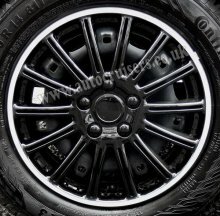 13" inch Gloss Black with White Ring Multispoke High Impact ABS Plastic Quality Car Wheel Trims. 4 Piece set. 13 inch, 4 universal wheel trims in a colourful box. High impact Durable ABS plastic with metal retaining rings. Easy to clean and attractive appearance. Rust proof & Corrosion Resistant. 4 x Silver Chrome Look Dust Caps and 8 x Black Cable Ties. Car Tyre 9mm TUV Approved N95 Snow Chains 15,16 &17"